I hate when Christians say that. I hate when I say and accept it. What the heck is good enough? Doesn't that term just cut our ability to live and love like Jesus off at the knees? Don't we lose something key when we accept it's blasé attitude? And, with such a disregarding mindset, aren't we nonchalantly inviting in Satan's sinful excuses? 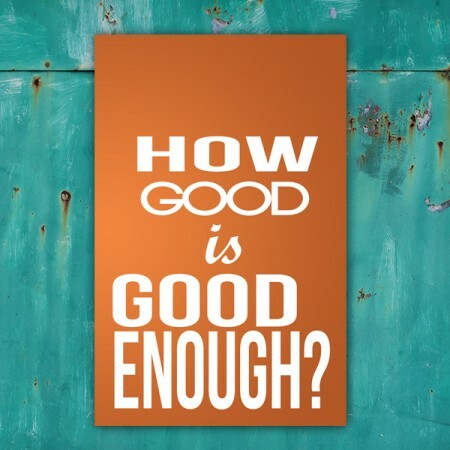 I think we default to "good enough" when we selfishly don't want to be bothered with whatever it is the Lord is challenging us to surrender over to Him. When we no longer choose to strive for what is godly, but rather, do what seems passable enough in order to avoid making waves. This is the place where our lukewarm hearts rationalize an unhealthy relationship with Mr. Minimum Effort. Here is where we teeter on the county lines of the almost. The so-so. The toxically tolerable. "Oh, that's good enough," we defend. But is it? Honestly? What about mirroring the Savior's Way? What about emulating His holiness in all areas? Thank goodness that such deficient thinking is not the Way of our Creator. Let us be thankful that on the seventh day He didn't step back and say that all creation was, well.... good enough. No, it was GOOD! Everything God does is good! Even after man disobeys Him, we still see evidence of His grace... His magnificent splendor prevails in what we foolishly dub as ordinary. How impressive is the Master's plan! How intricate are the details and efforts of His perfect design! We are each fearfully and wonderfully made by the hand of the One who is indeed GOOD! How excellent is His Name in all the earth! For the Carpenter builds and constructs perfectly. The Great Physician heals and restores completely. And thankfully, the King of kings will never allow His kingdom to come up short. For He always does things accurately and for good. In every second that ticks on the clock, He demonstrates that He is holy. He alone sets the standard for what is unchanging, eternal, sound, perfect! Friends, the Savior didn't say in John 10:11, "I am the 'good enough' Shepherd...." No, He said, “I am the GOOD Shepherd." And, the Good Shepherd lays down his life for His sheep and intimately knows His sheep! As such, He came to save each of us from the sin of "good enough"... from the obvious and immense void that we are tempted to settle for due to our own corrupted human mediocracy. Thankfully, our Good Shepherd proved His divine identity and unique character by overcoming all sin and death so that we might be restored to His full and holy purpose. Let me say that again... JESUS HAS MADE IT POSSIBLE FOR EACH OF US TO BE RESTORED TO HIS FULL AND HOLY PURPOSE! Surely, this is the day to rejoice and be glad in Him!!! Yes, rather than be good enough... let's submit and allow Jesus to perfect us into holiness! For true goodness is evidenced solely in His character. He alone is the One who drives out all imperfection! He alone is GOOD and ENOUGH for us!!! So, accept no substitute! Accept nothing less than the excellence of Jesus... The Good Shepherd! The faithful Redeemer! Today, accept nothing but God's holy purpose for your life! Fix your eyes on Him alone, and be blessed as you abide in His perfect Law! For His truths are eternal, and His gifts are available right now! So, embrace His perfection. Follow His Way. Never settle for second best. Instead, adopt His goodness! Strive for His hope. Live in His assurance. For He alone is enough!